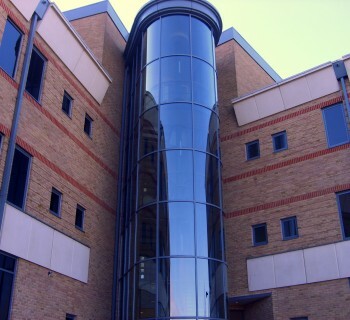 Aluminium Solutions supply an extensive range of windows, doors, curtain walling and ground floor treatment systems that are ideally suited to the Commercial sector such as office blocks, industrial and retail parks. Our aluminium products are aesthetically pleasing, meeting the design requirements of modern buildings whilst providing a high performance, robust and low maintenance product. With narrow sightlines, configuration flexibility and a wide range of colours and finishes to choose from, our systems are ideal for any modern commercial build. Aluminium Solutions’ curtain walling has been specified and installed widely in high rise commercial installations. Our strong yet lightweight product provides the ideal solution for multi-floor applications whilst providing a high performance, energy efficient structure demanded by modern buildings. We manufacture a wide range of manual and automated aluminium doors integral to our ground floor treatment according to your specific access requirements that together with our windows and curtain walling provide an integrated system. Safe and secure, our door systems are compliant with latest disabled access legislation and include high quality multi-point locking mechanisms together with an additional range of security features. Combined with the inherent strength of aluminium our doors are the ideal secure solution for any building. Click here to find out more about our range of commercial aluminium doors systems. Where a building requires low rise framing ie a ground floor integrated bank of windows and access door, Aluminium Solutions offers a complete system for ground floor treatment. Typical applications include commercial buildings as well as public buildings and schools, the retail sector and residential buildings. We provide a high performance solution that is both versatile and adaptable for any ground floor treatment with windows and doors that can be optionally thermally broken. Narrow aluminium profiles ensure a desirable slimline look for any building. Large display windows can be supplied insulated or non-insulated.